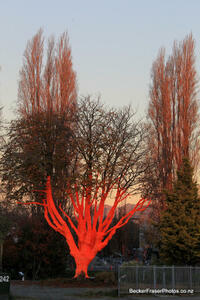 Showing 1 - 20 of 1,947 results. 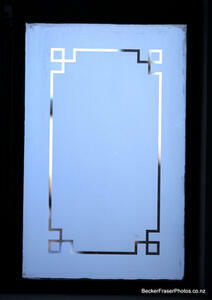 Photograph captioned by BeckerFraserPhotos, "Detail of the windows in Alice in Videoland. The building was designed with permanence and strength in mind and the new owner intends the fit out to have the same feel of permanence. 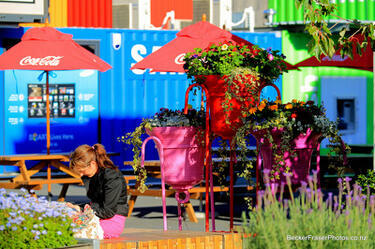 His aspiration is to build the best coffee house in the world and the largest in Christchurch". 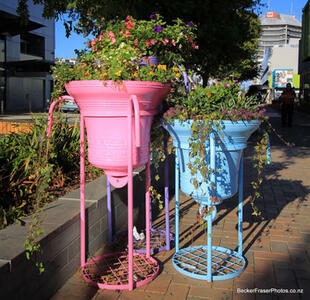 Photograph captioned by BeckerFraserPhotos, "An exhibit from the Festival of Flowers in the Botanic Gardens which has been moved to the Re:Start Mall on Cashel Street". 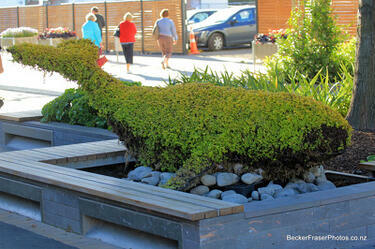 Photograph captioned by BeckerFraserPhotos, "An exhibit from the Festival of Flowers which was moved from the Botanical Gardens to the Re:Start Mall on Cashel Street". 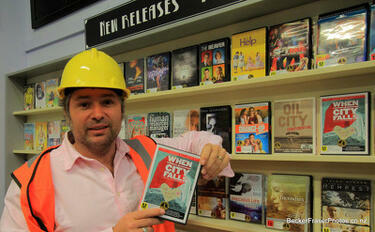 Photograph captioned by BeckerFraserPhotos, "Jeremy Stewart of Alice in Videoland holding 'When a City Falls', the film recently released about the 2010 and 2011 Canterbury earthquakes". Photograph captioned by BeckerFraserPhotos, "The new Westende Jewellers building on the corner of Manchester and Worcester Streets. 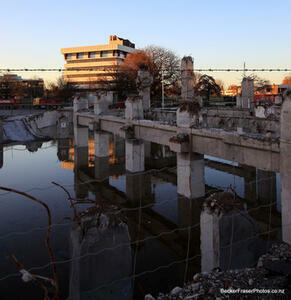 The former building collapsed in the 4 September 2010 earthquake". 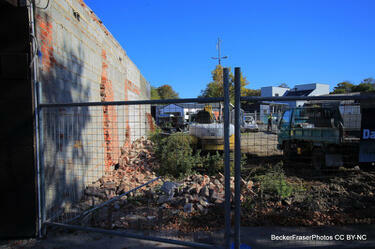 Photograph captioned by BeckerFraserPhotos, "The Environment Canterbury Emergency Management Office". Photograph captioned by BeckerFraserPhotos, "Substantial site development in Kennedys Bush Road, near the intersection with School Road". 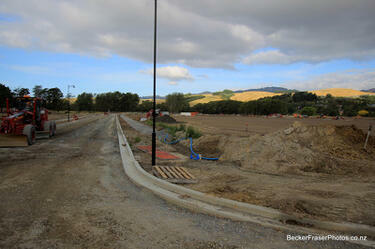 Photograph captioned by BeckerFraserPhotos, "497 Papanui Road". 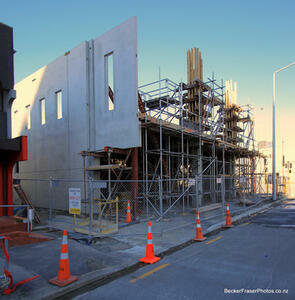 Photograph captioned by BeckerFraserPhotos, "New building at 511 Papanui Road". 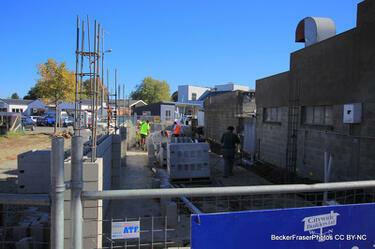 Photograph captioned by BeckerFraserPhotos, "New build at 493 Papanui Road". 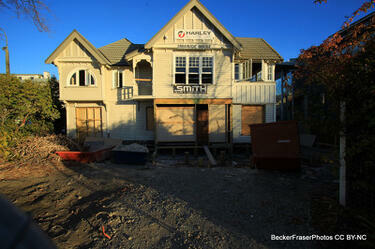 Photograph captioned by BeckerFraserPhotos, "Ironside House on Salisbury Street under restoration". The PricewaterhouseCoopers demolition site on Armagh Street viewed through a barbed wire fence. Water has filled the basement area. 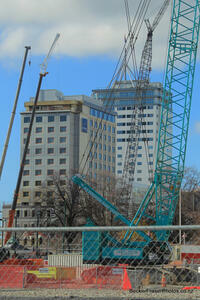 Multiple cranes viewed through a cordon fence. The Novotel Hotel building stands in the foreground and the Rendezvous Hotel building in background. 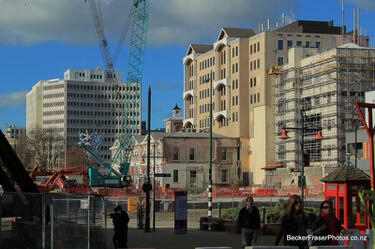 A photograph captioned by BeckerFraserPhotos, "The Telecom building, the Old Exchange Building and the Old Post Office are all in this photo as well as the Millennium Hotel and a few cranes". 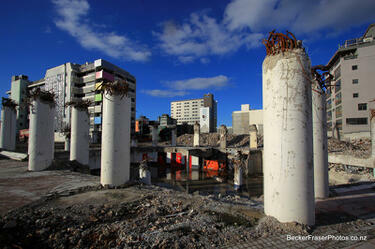 The demolition site of the Holiday Inn City Centre on Cashel Street. Reinforcement cabling protrudes from the top of the concrete posts. Rubble from the demolition surrounds the site. 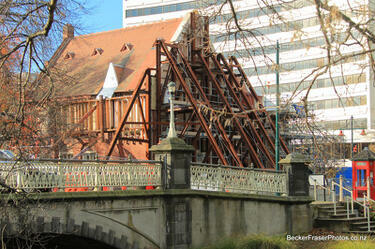 A view from Cambridge Terrace of the damaged Our City O-Tautahi building, formerly the Municipal Chambers. 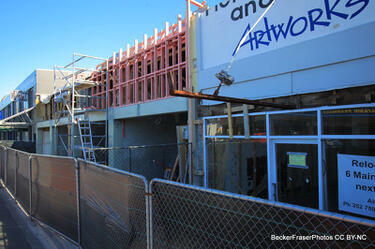 Scaffolding and steel bracing has been placed along the front of the building. 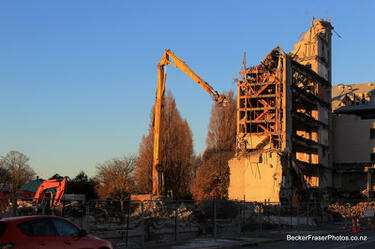 A photograph captioned by BeckerFraserPhotos, "Demolition of the BNZ building in Armagh Street".